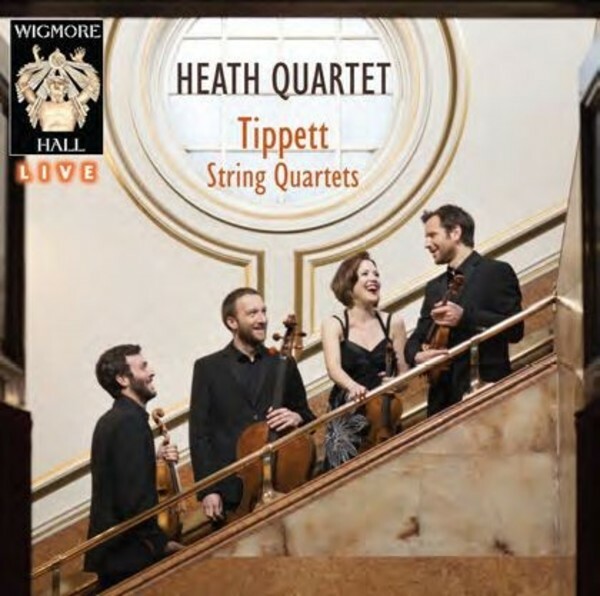 Sir Michael Tippett’s complete String Quartets are given fresh perspectives by the vibrant and adventurous Heath Quartet. The first ensemble in 10 years to receive the Royal Philharmonic Society’s Young Artist Award, the Heaths bring irresistible energy to these works. From Quartet No.1, premièred in what was the first professional performance of the composer’s music, and Quartet No.3, written during the Second World War whilst Tippett, a committed pacifist, faced a prison sentence, to his landmark fifth and final quartet, Tippett’s stirring and powerfully individual writing is recorded in the intimate acoustic of Wigmore Hall. Since being selected by YCAT and winning 1st Prize at the Tromp Competition in 2008, the Heath Quartet has forged a strong international presence. In 2011 they were awarded a prestigious Borletti-Buitoni Special Ensemble Scholarship and undertook complete Beethoven cycles at the Facyl Festival in Salamanca and in Edinburgh. Highlights over the last year have included recitals at Wigmore Hall as part of the Emerging Talent scheme, including the premiere of a new work by Luke Bedford and collaborations with Stephen Hough and Ian Bostridge. Recorded live at Wigmore Hall, London, on 3 December 2013, & 17 January, 16 March and 26 April 2014.